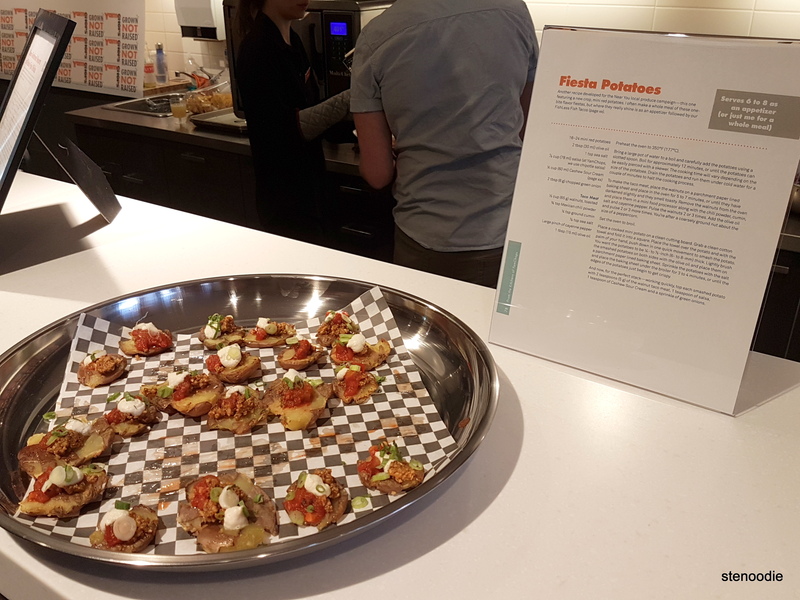 April 19, 2018: Back in mid-April, I had a pleasure of attending my first vegan cookbook launch event! 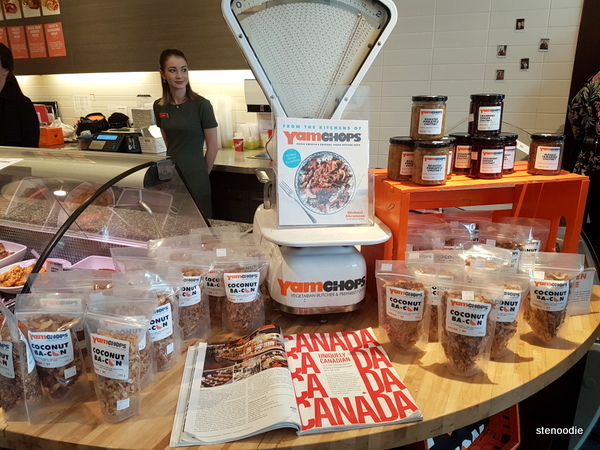 YamChops is Toronto’s only vegan (plant-based) “butcher” and they were holding a media event for fellow bloggers and foodie friends to visit to sample some bites as well as receive a free copy of the cookbook! 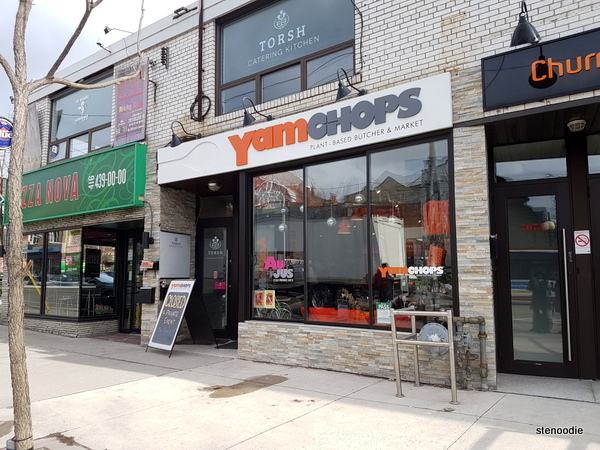 YamChops is located in Little Italy on College Street a few streets east of Ossington. Upon arriving, we were welcomed by the hostesses who befitted us with a name tag. We were given a gift bag that included the aforementioned cookbook and a lot of goodies as well. 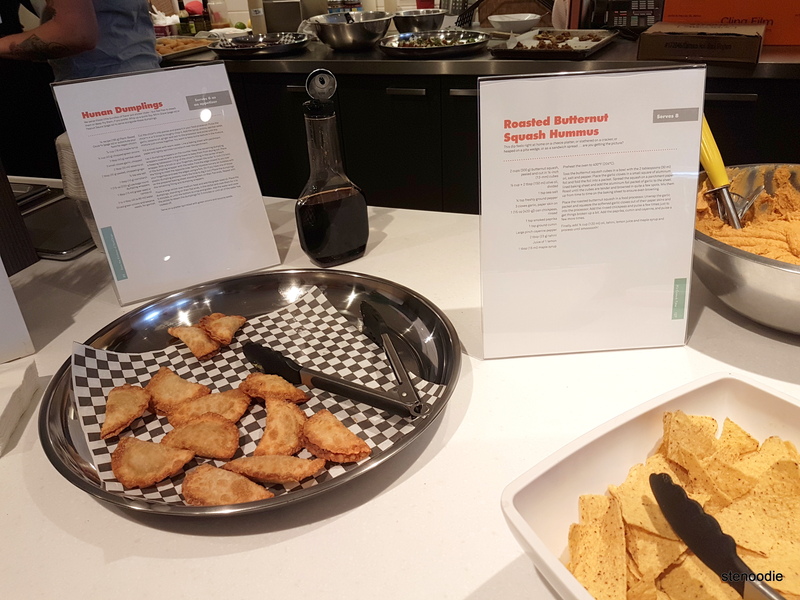 Throughout the evening, we were welcome to taste the sample vegan goodies that were set out for us. 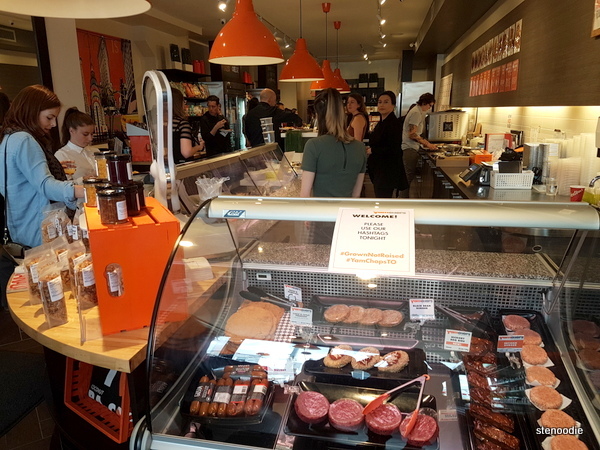 We were welcome to browse the shop as well. 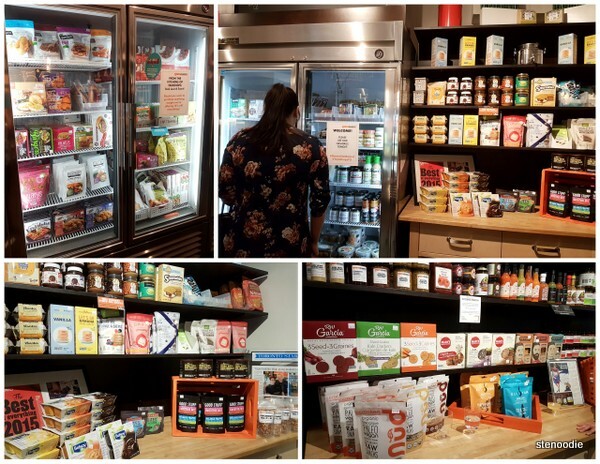 They indeed have lots of vegan selections including “meats”, sauces, dried goods, and other items you would find at a local butcher shop or market. 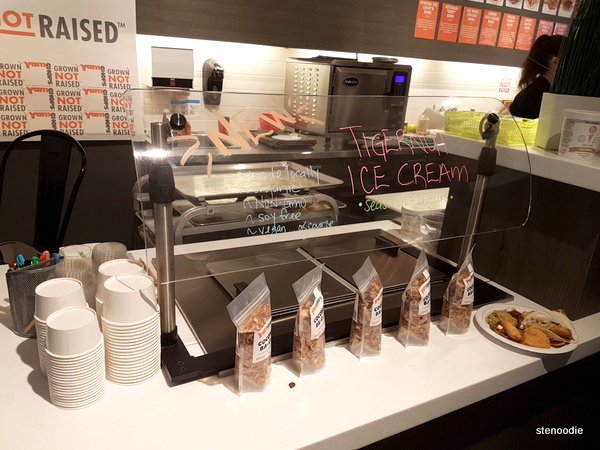 They also had vegan ice cream too. 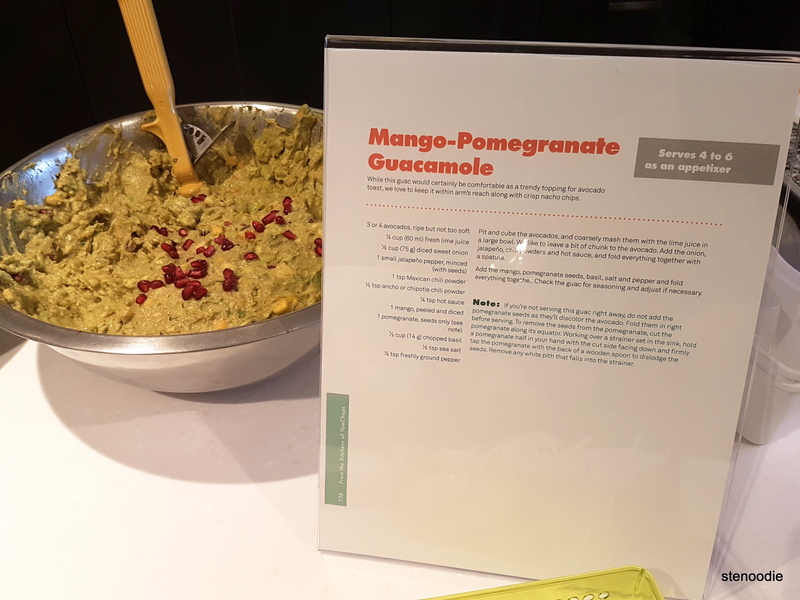 Among the samples that night, I tried the Hunan Dumplings, Roasted Butternut Squash Hummus, Mango-Pomegranate Guacamole, Fiesta Potatoes, and Beer-Battered Hearts of Palm Fysh Sticks (click the photos to view full-sized recipes). 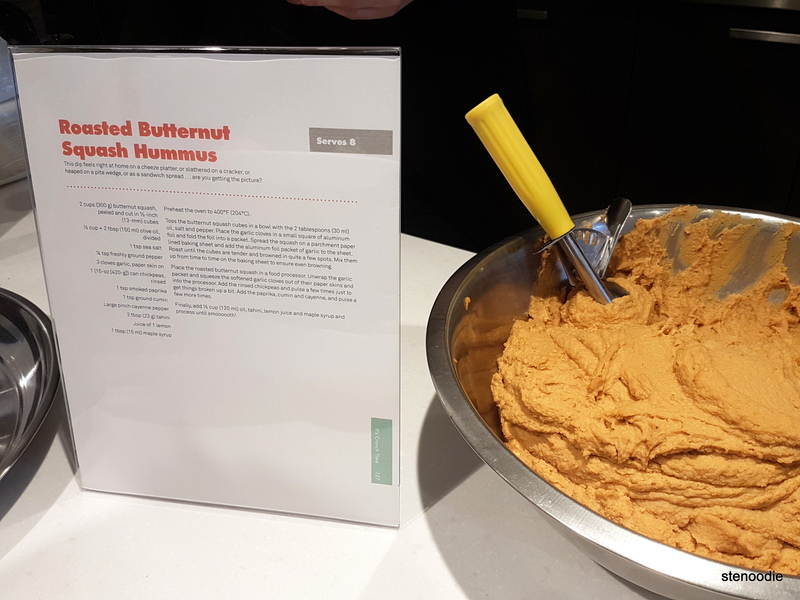 I always love how inventive and tasty vegan creations can be. 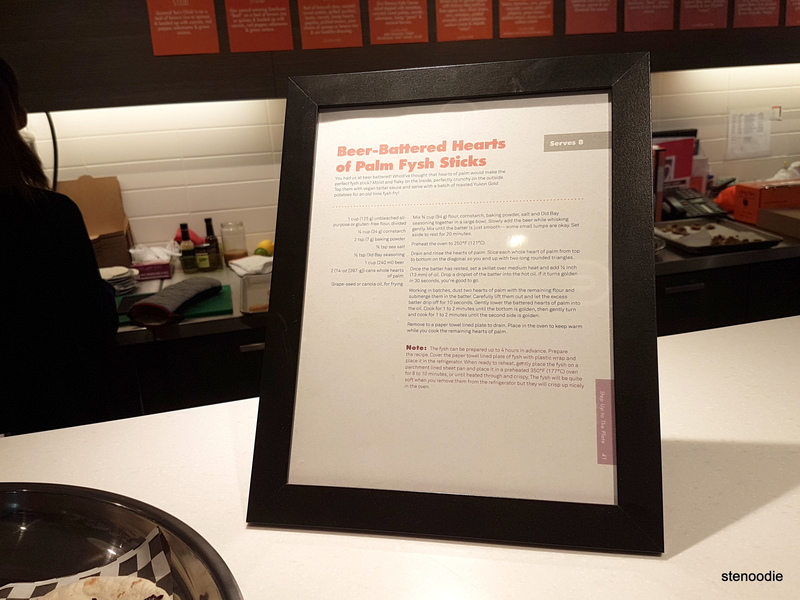 I especially liked the Beer-Battered Hearts of Palm Fysh Sticks. 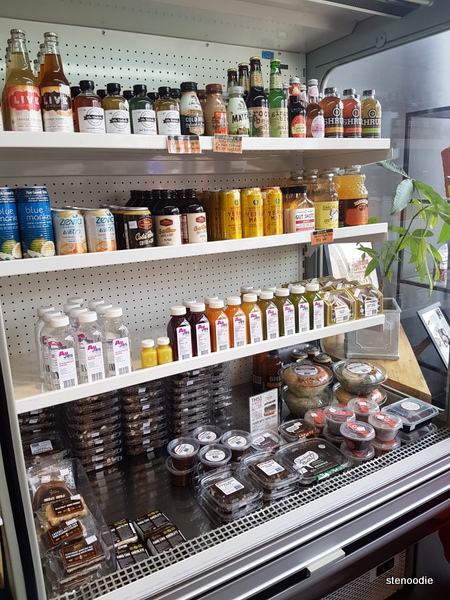 I also asked for a sample of the “Korean BBQ Chick’ N” which tasted very much like chicken indeed but of course made from plants. 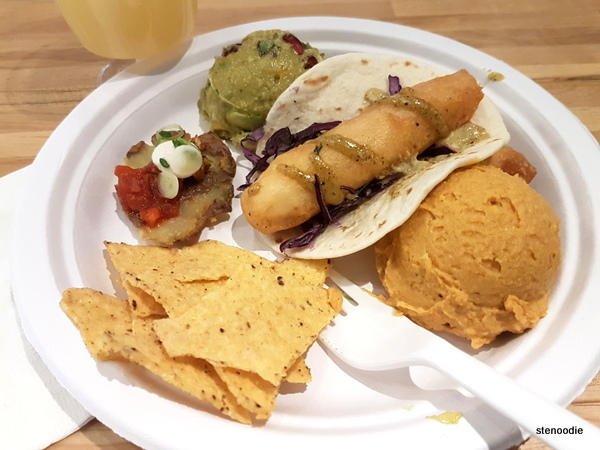 There was a generous amount of samples being given out that night and Grace and I definitely were able to go back for seconds after our first plate was done. 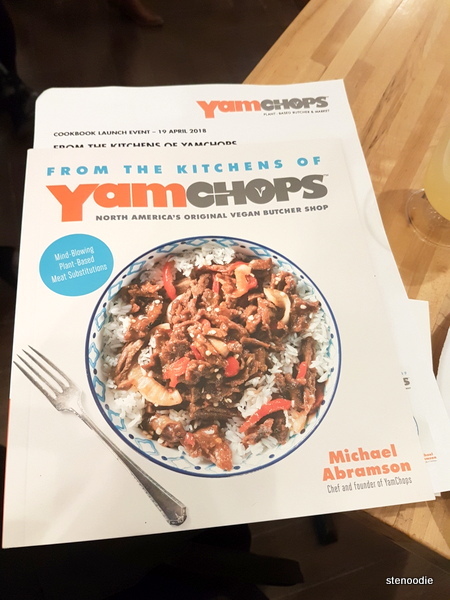 In between the night, we were able to meet and greet the author of the vegan cookbook, Michael Abramso. He was very nice and eager to share about his cookbook. 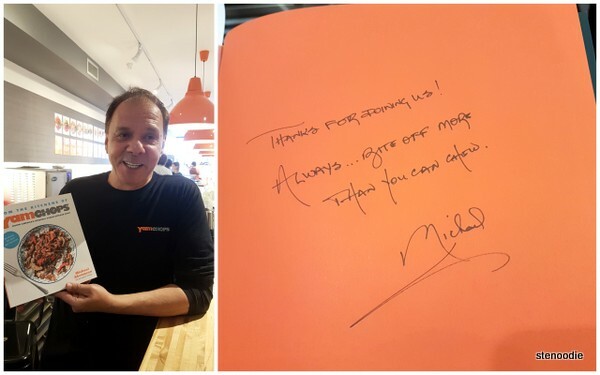 I also got a personalized signed cookbook from him as a result. 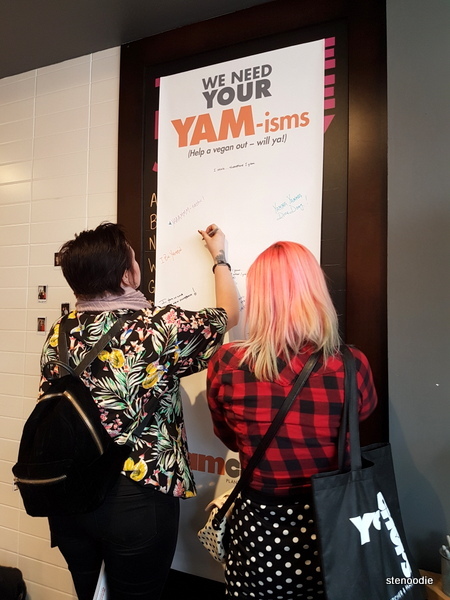 Before we left, we made sure to leave our personal “yam-ism” on the board. There were lots of punny jokes that were left behind from other fellow guests. 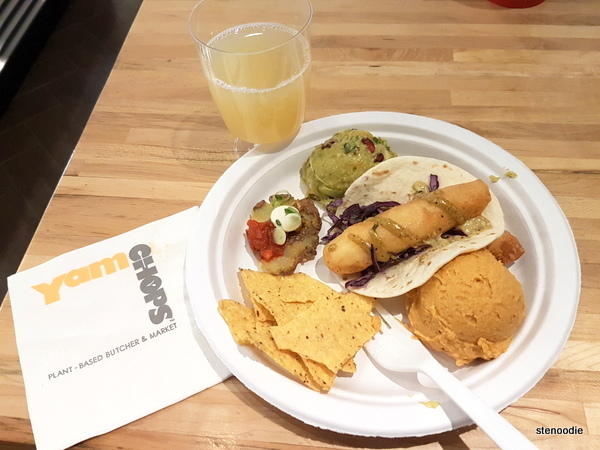 Thank you YamChops for inviting me to this launch event and allowing me to try your tasty vegan goodies! 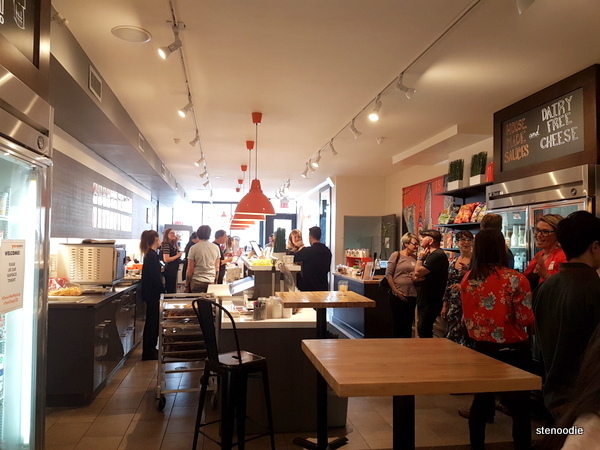 As I said, they had gifted each guest with a cookbook and a bag of goodies from their store. It wasn’t until I got home when I opened the gift bag to see that we were gifted so many great edibles! 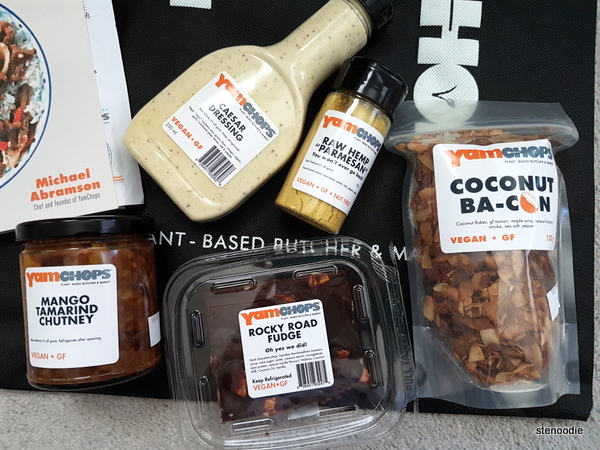 They gave us a bottle of Caesar Dressing, Coconut “Bacon”, Mango Tamarind Chutney sauce, Raw Hemp “Parmesan”, and a box of Rocky Road Fudge — all vegan of course! 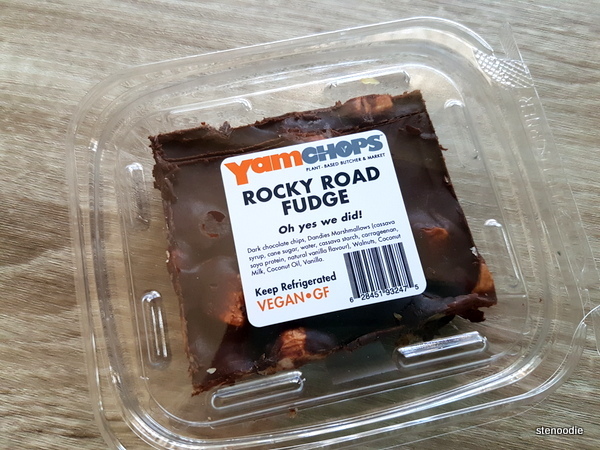 My favourite was the Rocky Road Fudge. 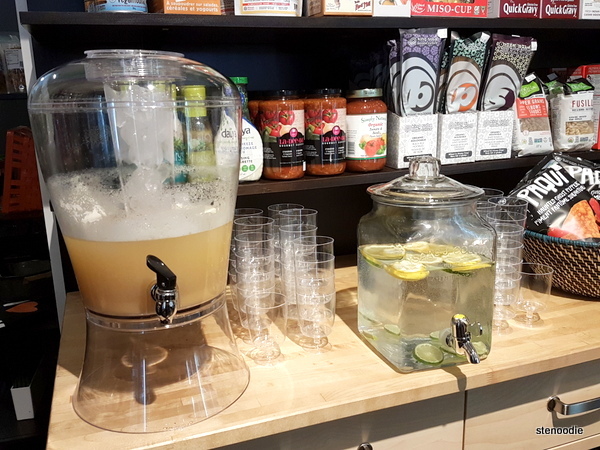 The dark chocolate chips, Dandies marshmallow (cassava syrup, cane sugar, water, cassava starch, carrageenan, soya protein, natural vanilla flavour), with walnuts, coconut milk, coconut oil, and vanilla concoction was so delicious! 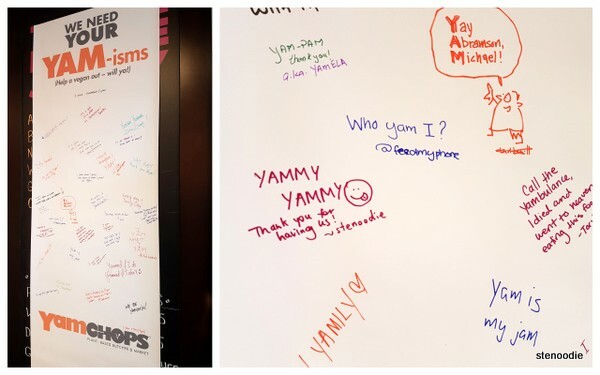 FTC Disclaimer: Although YamChops reached out and invited me to the event as a media guest, the opinions expressed here represent my own and not those of the company. 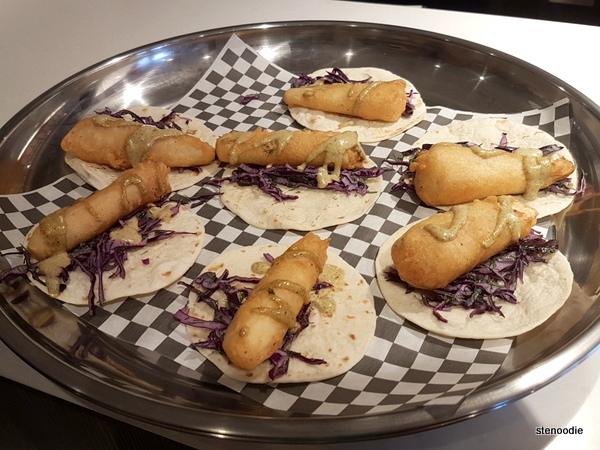 This entry was posted in Complimentary Adventures, Food and tagged 705 College St, Beer-Battered Hearts of Palm Fysh Sticks, Fiesta Potatoes, Hunan Dumplings, Mango-Pomegranate Guacamole, Michael Abramso vegan cookbook, plant-based butcher shop, Roasted Butternut Squash Hummus, Toronto, Toronto vegan meats, Toronto vegan shop, twitter @YamChopsTO, vegan butcher shop Toront, vegan cookbook recipes, vegan ice cream, Vegan juices and desserts, vegan Rocky Road Fudge, YamChops College Street, YamChops cookbook launch event, YamChops market selections. Bookmark the permalink.